If you find citrus and ginger overtones delightful in food, you are sure to love Tom Kha Gai, a flavorsome Thai coconut chicken soup. Tom Kha Gai, among Thailand’s most popular soups, may be served at the beginning of a meal or even as the entrée, perhaps with noodles. One thing about the foods of Thailand – they all have a sense of taste balance, including sweet, salty, tangy and savory references all together. This unique Thai coconut chicken soup is bursting with exotic flavour. Place coconut milk, water, lemongrass, kaffir lime leaves, galangal, chilies, basil and brown sugar, into a pot and bring it to boil. Add mushrooms and chicken and cook on medium heat for a few minutes or until the chicken is cooked through. Add lime juice and fish sauce. Put chopped coriander on soup when serving. * The galangal is preferred over the ginger in this soup because galangal’s flavour is a little different and more authentic. But if you cannot get galangal, use ginger. Thai Green Curry is pretty much my favorite food in the universe : ) Looking forward to trying this recipe...I have an assortment of coconut-thai flavored recipes! KALYANI: I remember the first time I had this in a restaurant, I was amazed at the taste. JOYCE: I like green curry, yellow curry and red curry. I like curries even Chinese-fusion curries. Your spouse is lucky (in my opinion), he gets to travel to Asia a lot. this sounds perfect on a usually chilly cloudy day like today! 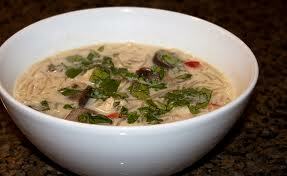 Thai soup? Now you're talkin'. LYNN PROCTOR: The aroma is so welcoming. NATE WILSON: Don't have enough info to go on. Important though, is that balance I mentioned, between sweet, salty etc. Please make this soup, it should taste as good (probably better) than your local Thai restaurant, unless you live in Bangkok. I love Thai food and this soup is amazing! sounds interesting, I've never tasted thai but always wanted to because of the balance you speak of, most american fare is one dimensional at best. LADYDRAGONFLY: Yes, it is an amazing soup. RCH: I agree with you and hope you will try this soup. SUSANNE DRAZIC: Tastes good too.